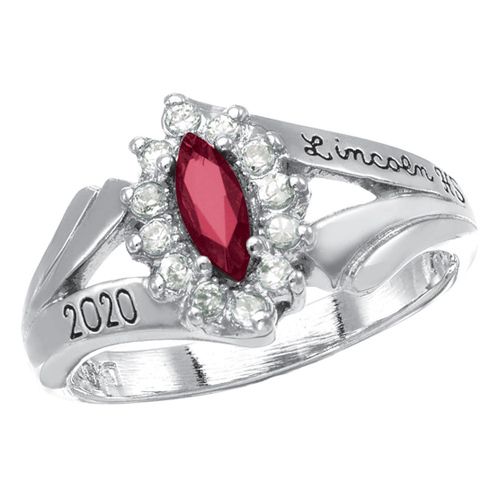 The girls' sterling silver Starlight class ring features two engraving areas, a simulated navette shaped center stone, and cubic zirconia accents. Standard fit. Center stone size: 7mm x 3mm. 12 round cubic zirconia accents. Enjoy ArtCarved's limited lifetime warranty. Import. My daughter loves her class ring! My daughter loves her class ring!! The ring is absolutely gorgeous, however, it makes for a rather poor a class ring. The extremely thin band forces the engraving of a name and/or a year to be terribly small and nearly impossible to read. Please note: there's absolutely no point in adding a sentiment to the inside of the ring either, as that is completely unreadable. For those reasons, I'm a very disappointed mom. My daughter, on the other hand, loves it! She's a girlie girl who thoroughly enjoys the "bling" over capturing the milestones of her high school career. Very pretty ring, my granddaughter loves it.